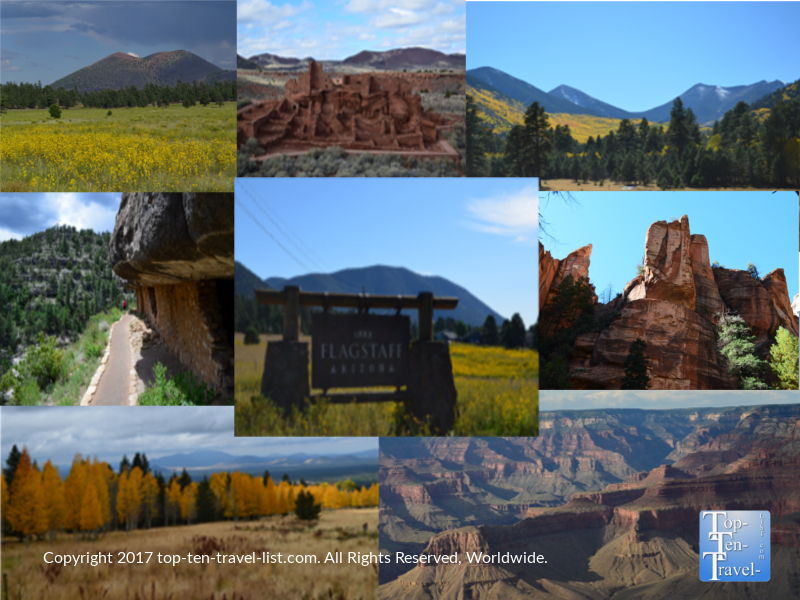 Flagstaff: The City of 7 Wonders - Top Ten Travel Blog | Our experiences traveling throughout the US. Flagstaff, Arizona has been nicknamed “The City of 7 wonders” due to its’ close proximity to a number of fascinating natural wonders. Most of us that are familiar with the city associate it solely with the Grand Canyon, although there are a handful of diverse sights you will want to check out on your next vacation to the Northern Arizona region. Coconino National Forest. Flagstaff is surrounded by the beautiful Coconino National Forest, which is home to the largest strand of ponderosa pine trees in the world. Thus, the scenery in this small, high altitude Arizona college town is vastly different from that of the lower Sonoran desert of Southern Arizona. All of these stunning natural attractions are within an hour and a half from the city, so you can easily explore a few during your vacation. Below I have provided a brief overview of each of these wonders so you can decide which to incorporate into your Northern Arizona vacation. However, if you have the time, I recommend checking all of them out while you have the opportunity! Obviously, the Grand Canyon is the big one to visit while you are in Arizona. This must-see natural wonder, which surprisingly is not considered one of the 7 wonders of the world (although it is considered one of the 7 wonders of the Natural World), is still widely considered to be one of the places to see before you die. While there are numerous overlooks and a nice paved trail known as the Rim trail where you will be treated to endless views of the massive 1 mile deep, 277 foot, & 18 foot wide long gorge, not too many tourists are aware that you can actually hike the Grand Canyon. Hiking the South Kalibab trail is an amazing experience and although the entire 3 mile trek is quite difficult (yet stunning spectacular and so worth it! ), there are several different scenic viewpoints so you can go out to your comfort level. Or, as a less intensive alternative, book a guided mule ride which will enable you to enjoy the same stunning scenery minus the extreme effort. Whitewater rafting trips are awesome but very expensive and require plenty of advance planning. While the South Rim gets all the attention, The North Rim (which is a bit further from Flagstaff at 3.5 hours away) is definitely worth a look if you have the extra time. This area is is not overly crowded like the South Rim and is even more beautiful due to the higher elevation (8000 ft) and you will find a wider variety of trees including golden aspens in the fall. Keep in mind that the North Rim is closed in the winter while the South Rim is open year-round. Also keep in mind that the weather at the canyon is quite unpredictable with frequent monsoon storms in the summer and occasional snow in the winter (yes, the Northern Arizona winter season is very different from that of the Sonoran desert of lower Arizona!). Be prepared for the high altitude (7000 ft) with plenty of extra water. 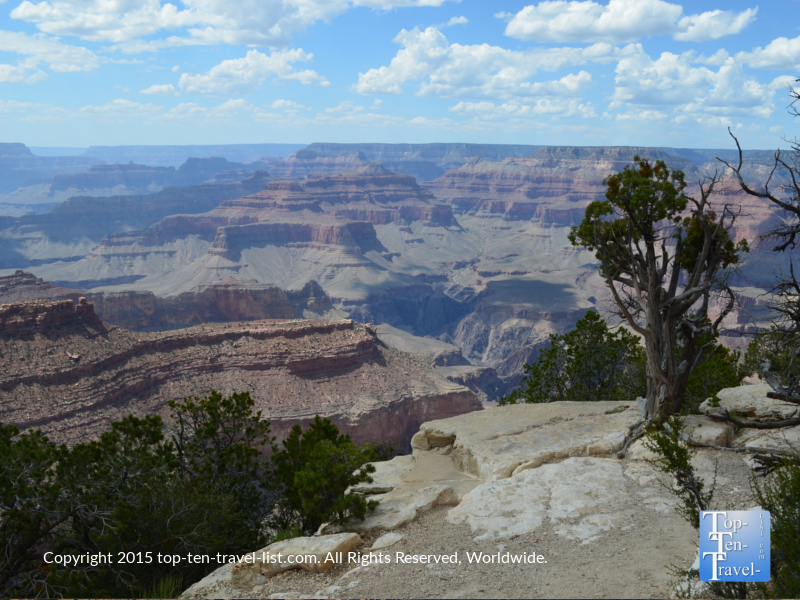 Here’s a few more helpful tips for your Grand Canyon vacation. 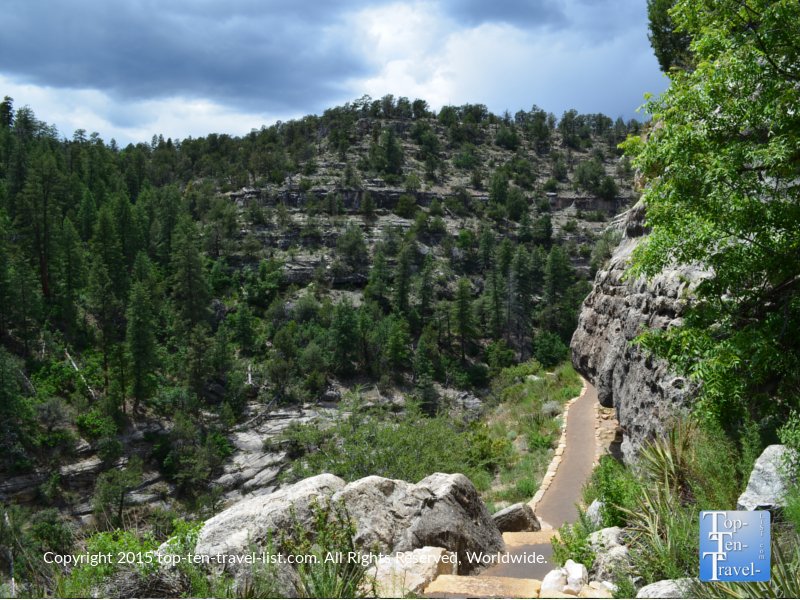 Oak Creek Canyon is a gorgeous river gorge situated between Flagstaff and Sedona. More and more people are flocking to this area which has now become the 2nd top Arizona tourist attraction next to the Grand Canyon. 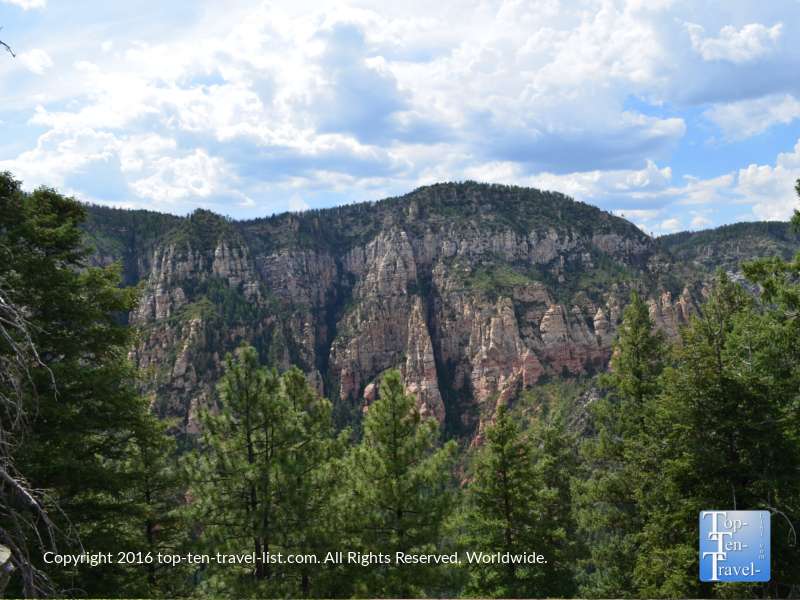 Just south of Flagstaff begins the incredibly scenic Oak Creek Canyon drive, a visually stunning & diverse 14 mile drive which takes you past serene ponderosa forests and towering ancient red rock formations. The scenery here is very diverse & quite rare for Arizona, and it also happens to be one of the few places where you can leaf peep amongst the traditional medley of autumn colors as opposed to the golden aspens typically found in Western high altitude areas. There are lots of overlooks and fun stops along the way including the beautiful West Fork Trail which really shines during the fall foliage season due to the abundance of maple and oak trees. Indian Gardens is a wonderful local breakfast spot with terrific food and espresso and the best outdoor patio. Several Native American stands along the way give you the opportunity to pick up quality handcrafted dreamcatchers and pottery pieces. In the fall, you can pick your own apples at Slide Rock State Park while in the summer you can slide down natural sandstone waterslides. In the winter time, the red rocks are often dusted with a light layer of snow for a truly awe-inspiring view. The great thing about Oak Creek Canyon is that it is much cooler than Southern Arizona, and thus, you can comfortably visit anytime of year. The end of the drive leads you into Red Rock Wonderland where you can enjoy one of Sedona’s 100 miles of breathtaking trails. Here are 6 easy Sedona trails with amazing views to get you started! Walnut Canyon is one of the most mesmerizing natural wonders in Northern Arizona and it’s only a quick 20 minute drive outside of Flagstaff. This spectacular canyon is pretty massive at 400 feet deep, 20 miles long, and as you can imagine, the views are nothing short of spectacular. You will even get a peak of the magnificent San Fran Peaks from one of the trails. There are 2 short trails here, the more spectacular being the Island Trail which takes you past 20 ancient cliff dwellings. It’s quite an interesting experience to explore the ruins of the ancient Singua tribes who occupied the area sometime between A.D. 1125 and 1250. The Singua cherished this area due to the rare presence of water in an area lacking natural resources. The name Singua comes from the Spanish term “Sierra Sin Agua,” which translates into “mountains without water. Despite the lack of water, the Singua were able to thrive quite well in such an arid area. Be prepared for a hefty 200+ stair climb at 7000 feet – a bit difficult, yet worth it for the stunning scenery. Wupatki is the site of several well preserved 1000 year old pueblo ruins just a half hour outside of Flagstaff. 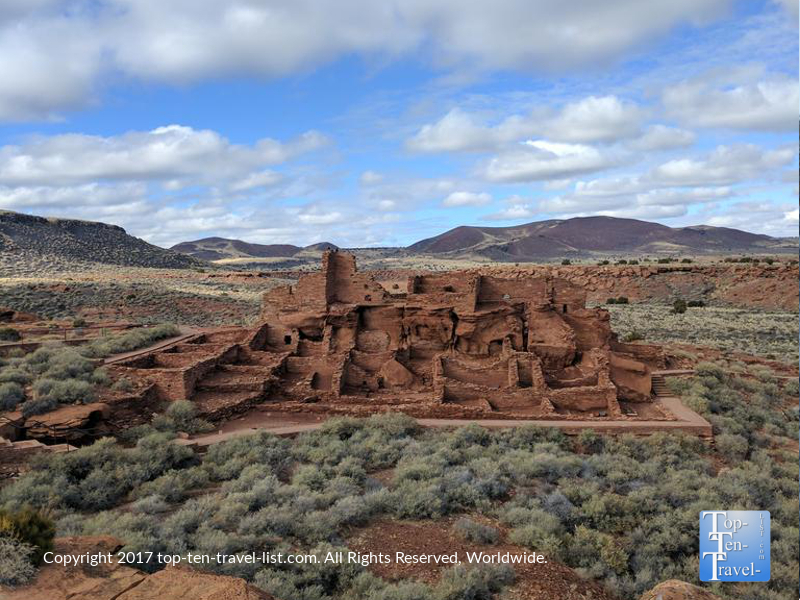 If you are interested in Southwestern history and culture, you will want to make it a point to visit Wupatki. This is probably my least favorite of the natural attractions surrounding Flagstaff as I am not really a fan of the barren desert scenery, however, it’s worth a look if you are a history buff or are on an extended vacation looking for more places to visit in the area. The most interesting site here is a 100 room 4 story pueblo which was occupied in the 1100’s. It’s crazy to think that people were able to thrive and grow food in an area with little water. There is also an interesting blowhole (known as a Spirit Hole by the ancient tribes) which is basically a hole in the ground where air naturally blows in and out of the ground like a vacuum. It really is an unexplained mystery and no one really knows what is down there. Hopi legend goes that the blowholes are connected to the supernatural, and are considered openings to the wind god, Yaponcha. The spiritual significance may be the reason for the tribes building so close by.